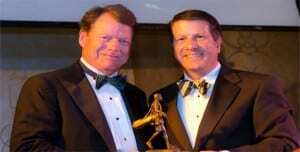 The City of Chicago was recently once again honored with golf royalty as 8-time major champion Tom Watson was in town to attend the Western Golf Association’s second annual Green Coat Gala at The Peninsula Chicago. The man who has won 70 professional golf tournaments, including three Western Open victories in 1974, 1977 and 1984 was honored with induction into the Caddie Hall of Fame, which honors former caddies and other caddie supporters. The Green Coat Gala event on November 9th helped raise over $400,000 to help send deserving caddies to college on an Evans Scholarship. The event featured live and silent auctions as well as a paddle raise for donations to the Evans Scholars Program. Watson was inducted by John Kaczkowski, President and CEO of the Western Golf Association. The WGA, which is headquartered in the Northern suburb of Golf, is one of the United States’ oldest golf organizations. The Association sponsors multiple prestigious golf tournaments and has also administered the Chick Evans Scholarship Program for deserving caddies since its inception in 1930 through the Evans Scholars Foundation. Guests were treated to presentations by Tom Watson and Evans Scholar Maryclaret Ndubuisi-Obi, a sophomore at Marquette University. Watson paid special tribute to his own longtime caddie Bruce Edwards, who died after battling ALS. Ndubuisi-Obi spoke about her journey from Nigeria, where she and her family lived in a cramped apartment and struggled for food, running water and electricity. Her father brought her and her brothers to America for a chance at a better life. When she began caddying at Oak Park Country Club, she realized the Evans Scholarship could help her achieve her dream of going to medical school and becoming an obstetrician. Ndubuisi-Obi is one of 835 Evans Scholars at 19 universities across the country this year. Proceeds from the Gala will help pay tuition to continue sending deserving caddies to college. To learn more, visit the Western Golf Association website.